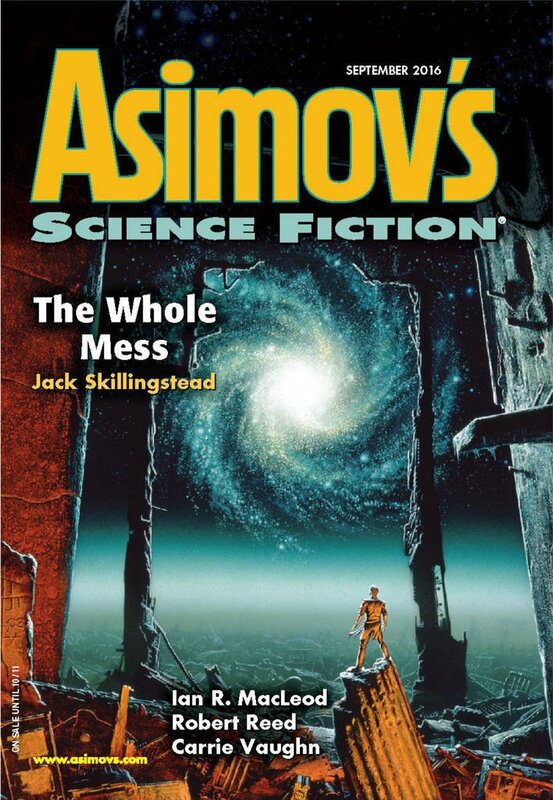 "The Whole Mess," by Jack Skillingstead [bio] (edited by Sheila Williams), appeared in Asimov's Science Fiction issue 09|16, published on August 18, 2016 by Penny Publications. Pro: The plot is straightforward: first to solve the equation and then to undo it. Along the way, we learn a lot about Professor Dunn in his various incarnations, but even at the start, the way he doesn't just dismiss Whitfield out of hand tells us he's a good-hearted, open-minded man. We're not at all surprised when he doesn't take advantage of Lisa when she spend the night with him. And it's a great ending for him to head off to the Dean's Office to see if Lisa remembers their adventure as well, because we've been told he was lonely, and after his accomplishment, he definitely deserves to be with someone nice. The sequence of alternate worlds is interesting: in the first, his situation is much better, and his math ability is unchanged. In the second, his situation is much worse, and his math ability is absent. In the last one, his situation is terrible, but his math ability is strong if aberrant. He has obsessed over being a math genius his whole life, but he learns that it really isn't so central to who he is. He's the same nice guy in all "iterations." There's also some pretty good tension at various points. Con: The math described is rather trivial, and, of course, the whole idea of an equation's solution changing the world is silly. More seriously, it's not at all clear what Whitfield gets out of it, or, for that matter, why the Masters want to trash everything. I read it as a Lovecraftian scenario, in which case the motivations of the antagonists is irrelevant and unknowable anyway. I wasn't quite convinced by the cliche of the genius ending up as a hobo. Overall enjoyable though.